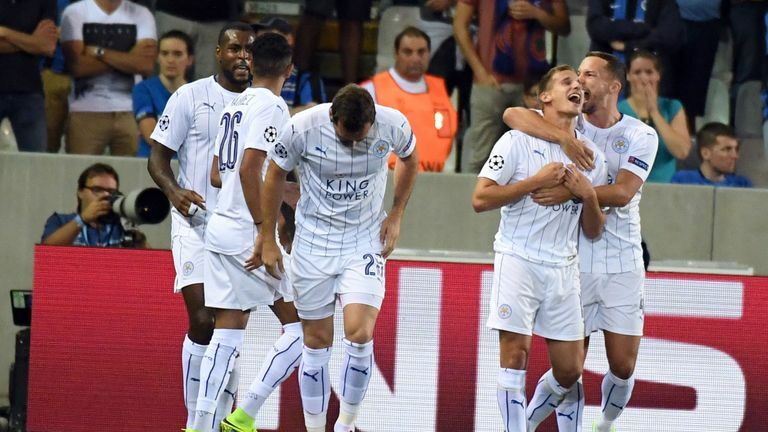 Leicester City cruised to a debut victory in the Champions League as they beat Club Brugge 3-0 at the Jan Breydel Stadium on Wednesday night. 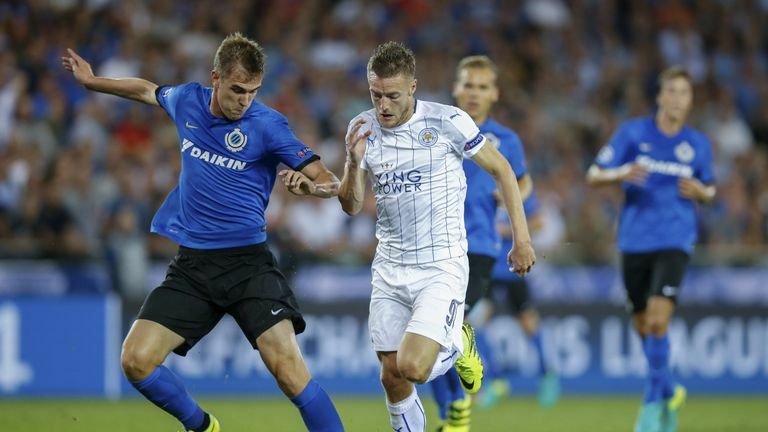 Leicester boss Claudio Ranieri made two changes from Saturday’s 4-1 defeat to Liverpool at Anfield handing a debut to club-record signing Islam Slimani, but it was a familiar face in Marc Albrighton who gave the champions of England a dream start in Bruges. The former Aston Villa midfielder ghosted in unmarked at the back post inside just five minutes to volley home Luis Hernandez’s long throw before Riyad Mahrez doubled Leicester’s lead just shy of the half-hour mark with a sublime free-kick from the edge of the box. Mahrez then helped himself to a second from the penalty spot 16 minutes after the break, converting after Jamie Vardy had been upended in the box by Brugge goalkeepr Ludovic Butelle to ensure Leicester took all three points back to the East Midlands. It was the home side who threatened first in a breathless opening five minutes, however, and they should have taken the lead when Jose Izquierdo was sent clean through on goal only to place his shot wide of Kasper Schemichel’s upright. It was a chance Brugge would rue almost immediately, as just seconds later the Foxes took the lead through Albrighton. Hernandez’s long throw wreaked havoc in the home side’s box and Albrighton was on hand at the back post to volley home unmarked after Brugge defender Hans Vanaken had inadvertently headed it into his path. The hosts were extremely fortunate not to be reduced to 10 men in the 28th minute when Timmy Simons cynically brought down Vardy on the edge of the box after he seized on a loose pass, but Mahrez duly delivered the ultimate punishment with a stunning strike into the top corner to give the English champions a 2-0 lead. The Algerian winger came close again 10 minutes later, flashing a curling effort wide of the far post after he had exchanged passes with countryman Slimani before Danny Drinkwater sent a sumptuous left-footed volley goal-wards from 30 yards that Ludovic Butelle had to be alert to tip over the bar. Vardy forced the French stopper into another save on the stroke of half-time after latching onto Slimani’s flick, but Ranieri had to be content with a two-goal cushion going into the break after a vintage performance from his charges in the opening 45 minutes. The hosts started the second half brightly in search of a riposte, with Izquierdo’s deflected effort comfortably finding the hands of Schmeichel but Mahrez put the game to bed just after the hour-mark. Vardy showed off his lightning pace against the Belgians in a classic Leicester counter-attack, racing through on goal only to be brought down by Butelle in the penalty area, with the ‘keeper beaten by Mahrez as he slammed home the third goal from the spot. The dangerous Izquierdo was then unfortunate not to register a consolation for the hosts when he cut inside only to see his drive thump the foot of the post and rebound to safety, while substitute Demarai Gray came close to adding a fourth for the Foxes when he rifled over from close range in the dying minutes. 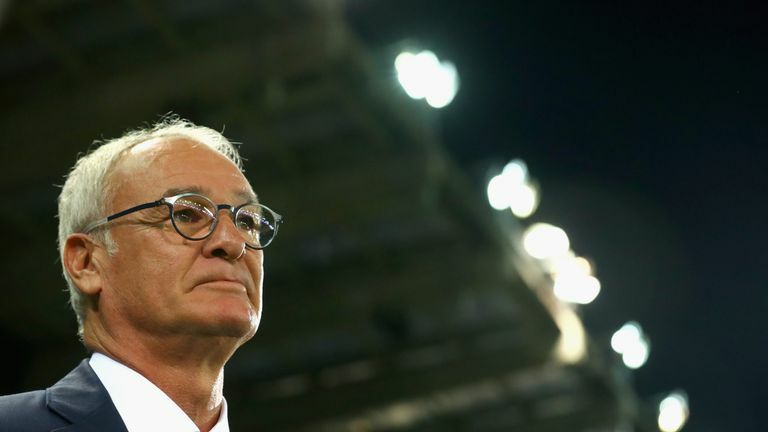 But nonetheless, Leicester continued their remarkable rise in Belgium as they top Group G before welcoming Burnley to the King Power Stadium in the Premier League on Saturday.